Male specimen from Normanby Island, Papua new Guinea. Type locality is ‘Letak Creek, 25 kilometers southeast of Wewak, Papua New Guinea’ with additional records from northern New Guinea and the islands of Normanby, New Hanover, and Bougainville off the northeastern coast of Papua New Guinea. The largest officially-recorded specimen measured 30 mm, but it may grow a little larger. An aquarium with base dimensions of 60 ∗ 30 cm or equivalent should be large enough for a pair or small group but use something bigger if you want to keep multiple species together since males are likely territorial to an extent. Base substrate can either be of gravel, sand or a mixture of both to which should be added a layer of water-worn rocks and pebbles of varying sizes, of which some should ideally be raised with flattended upper surfaces. 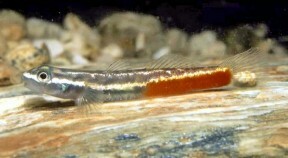 Aged driftwood can also be used but avoid new pieces since these usually leach tannins which discolour the water and reduce the effectiveness of artificial lighting, and these gobies naturally dwell in very clear water. Temperature: 22 – 26 °C; increased surface agitation is required to maintain dissolved oxygen levels towards the upper end of this range. Probably a specialised predator as per other members of the genus. Should be suitable for a community provided tankmates are chosen with care. Peaceful, pelagic species which naturally inhabit well-oxygenated streams such as Tanichthys, Microdevario, or smaller Danio species are the best choices for the upper levels, but we’ve also seen members of this genus being maintained with various characins, small poeciliid livebearers and freshwater shrimp from the genera Caridinia and Neocaridina. Unconfirmed, but females should be much plainer than males in terms of colour pattern. This species is not in the aquarium trade but may have been maintained by a handful of private collectors. The Gobiidae is the most speciose vertebrate family and notoriously problematic in terms of identifying members down to species level. Sicyopus is often included in the putative subfamily Sicydiinae which currently contains at least eight other genera; Akihito, Cotylopus, Lentipes, Parasicyidium, Sicydium, Sicyopterus, Smilosicyopus, and Stiphodon. Sicyopus, Smilosicyopus, and Lentipes species are omnivorous or carnivorous whereas the others are mostly herbivorous. Two new subgenera of Sicyopus, with a redescription of Sicyopus zosterophorum (Teleostei: Gobioidei: Sicydiinae). 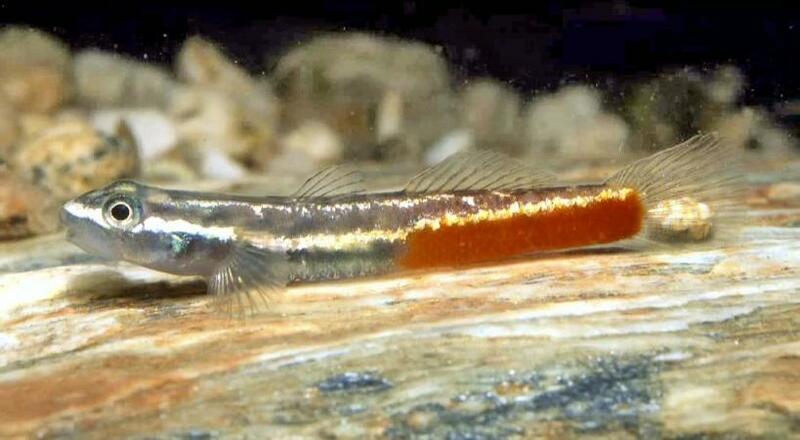 Two new freshwater gobies from Halmahera, Maluku, Indonesia (Teleostei: Gobioidei: Sicydiinae).